Anguish, remorse. Feeling loss of self-belief, experiencing a crisis of confidence. A man sits in bed and covers his face with his hands, showing feelings of worry or guilt. 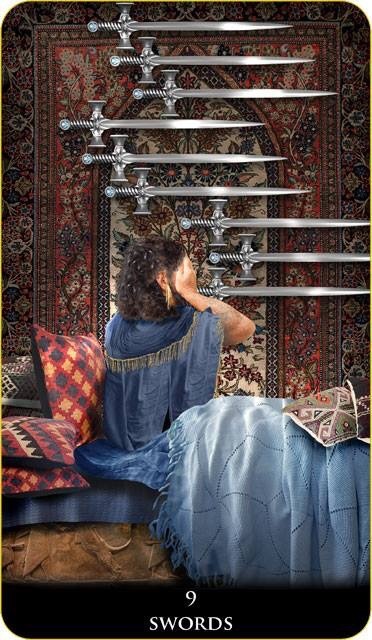 Nine swords are hanged on the carpeted wall above his head. The dim and gloomy lighting enforced the state of mood in this picture: the sense of anguish and depression. This scene transfers to a spectator the spirit of unhappiness and troubles that match the meanings of this card. This entry was posted in Artist, Deck Review, Featured Card of the Day, General Tarot, Readings and tagged 9 of Swords, New Babylonian, Roxana Paul, Tarot.